In a bowl, mix all the ingredients for the dough; once it has been homogenized, leave it in the refrigerator for 10 minutes. Meanwhile, prepare the cheese filling, combining all the ingredients except the myrtle berries. Grease the mold and using your fingers, press in the dough so it spreads evenly, covering the mold to the rim. Bake in the oven (preferably using the fan) for 15 minutes at 180oC until it acquires a golden color. If you want to have a smooth surface, cover with a sheet of greaseproof paper and spread some beans or chickpeas to keep the pastry down. 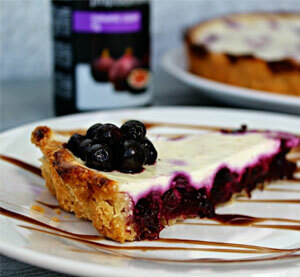 After 15 minutes of baking, put the blueberries on the baked base, sprinkle with the balsamic cream and the honey; then pour the cheese mixture. Bake for at least another 30-40 minutes. The cheesecake will be ready when the cheese mixture has solidified and lost its very creamy texture.